Xiaomi has always invested in technology for a healthy lifestyle. 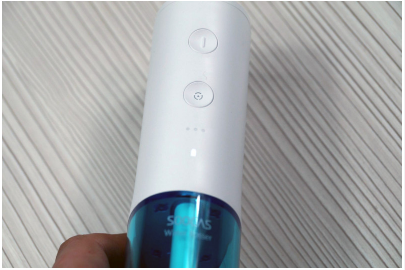 They have been inventing one after another gadget for a healthy being, and their electronic toothbrush series from Xiaomi SOOCAS is no exception. 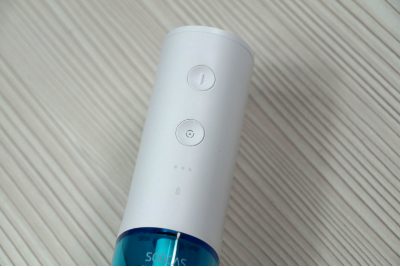 Continuing their tradition to bring smart devices, Xiaomi engineers once again came up with a new novelty for healthy teeth the Xiaomi SOOCAS W3. 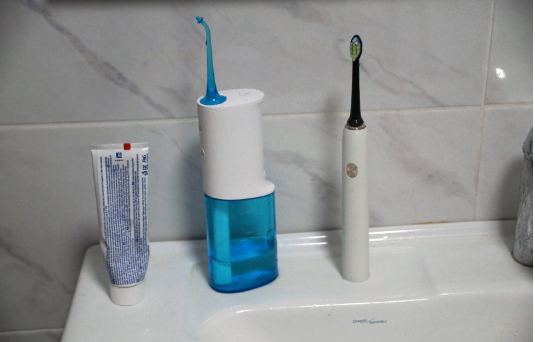 When used together with a toothbrush, it can remove even the smallest “debris” stuck between the teeth. For more information, we invite you to read further. 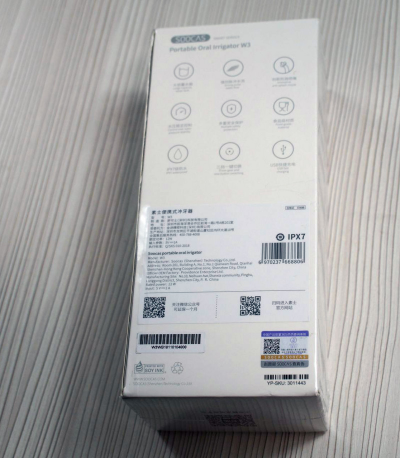 The Xiaomi SOOCAS W3 arrives in a nice usual Xiaomi style packaging. It took around two weeks to reach the package to us, including time at customs. 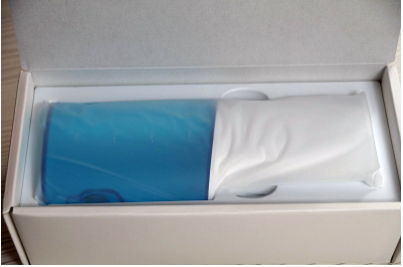 The entire packaging film on the box indicates that the customs officers did not use the irrigator precisely. 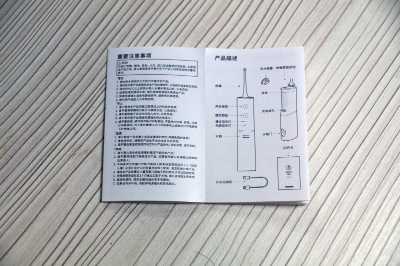 On the back side of the packaging, you will get the specification of the device sadly they are only in Chinese. In the lower right corner, under the protective layer, there is code to verify the originality of the goods from the site. 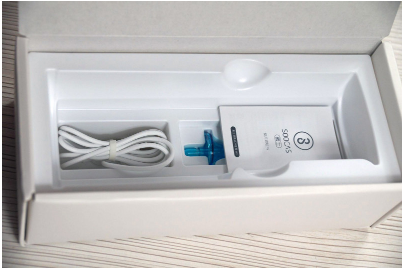 The box of Xiaomi SOOCAS W3 is made of thick cardboard, so there is no additional protection inside. The irrigator comes wrap in a plastic cover. Under the main irrigator, there is an irrigational tip with a small instruction manual. General equipment. 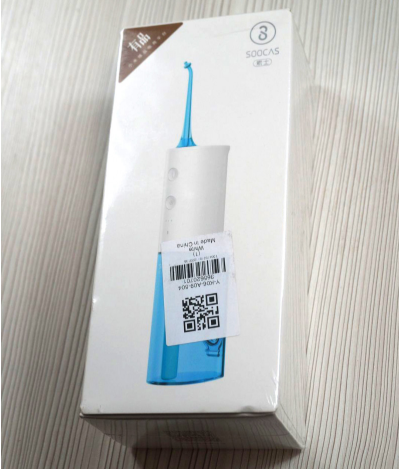 The QR code on the box is transferred to the online store Mi. Just like most of the products from Xiaomi, which are meant for the domestic market, the instruction manual is in Chinese. However, the truth is that there is not any particular need of it, as everything is clear and straightforward.. 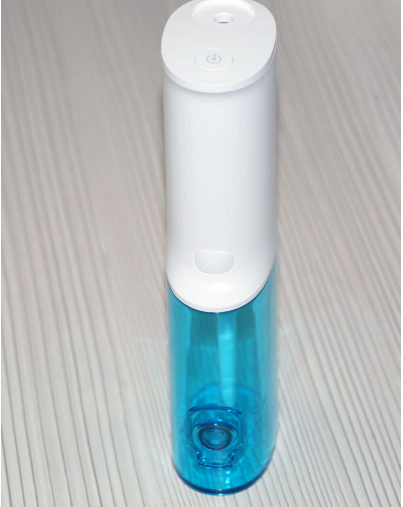 The nozzle of Xiaomi SOOCAS W3 is made of transparent and premium plastic. The rubber “O” ring is missing from the nozzle. We suspect maybe it is on the irrigator body, in order to avoid slipping or missing it. 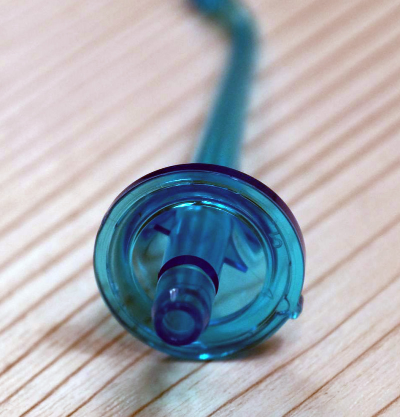 The nozzle spout comes with a skinny hole. In theory it is like that, to prevent splashing in all directions, however in fact, if you do not close your mouth, the spray will drift in all directions. For recharging the built-in battery of 2200 mAh a meter cable comes along the Xiaomi SOOCAS W3. At first, the irrigator arrives almost fully charged, however, for fully charging it takes around over an hour. 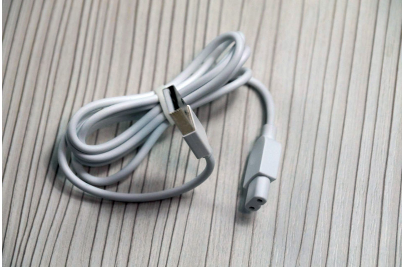 The Xiaomi SOOCAS W3 arrives without any charger, and the manufacturer provides only a USB cable. You can charge the device using your regular smartphone charger or even with the USB port of the laptop, the current should be enough. After completion of charging, the irrigator notifies with a LED indicator. 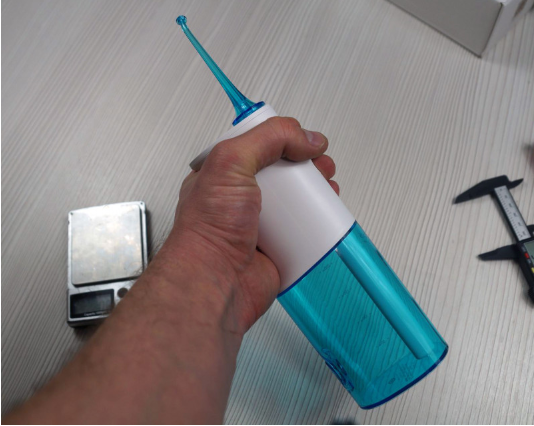 The Xiaomi has called this device as compact and in a rod shape, but we cannot call it a very small. 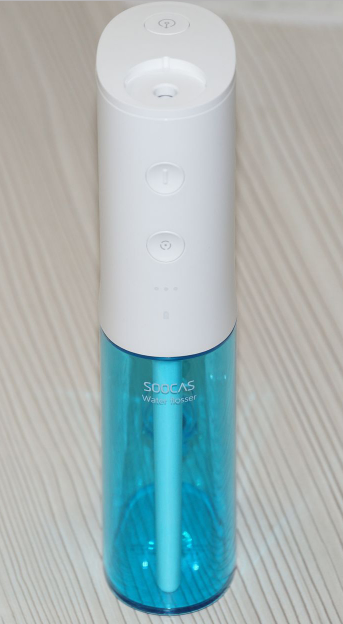 The Xiaomi SOOCAS W3 comes with a white top and bluish transparent bottom with a short inscription of Soocas. At the front side, there are on/off buttons, with choice of mode of operation, and everything is illuminated by “moon” LEDs just below. 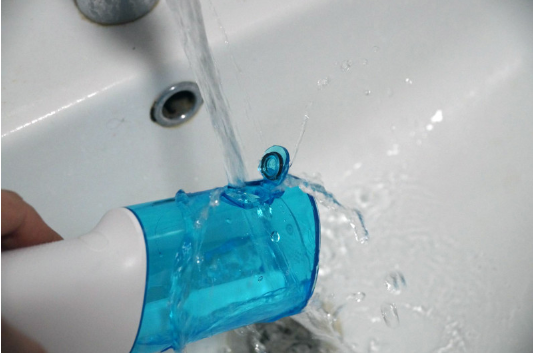 The water container is transparent and non- removable. On one side of the container, there are marking for the volume of water, but why, if everything is already visible what’s the use of marking? 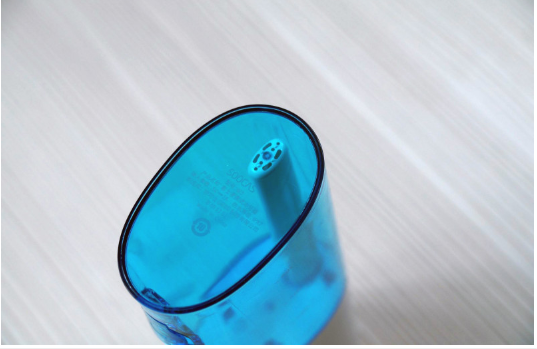 For filling the water into the container, there is a plastic stopper at the front. 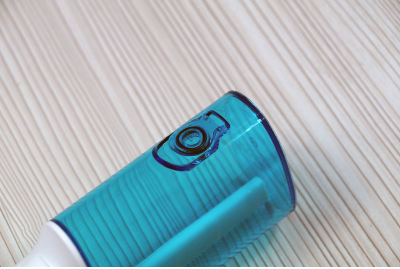 The transparent container is made of rather thick plastic and is durable, but at the same time try not to overdo it, as it can break off the mount. A rubber ring is also present in the mount, but it is a pity that there is no spare in the kit, in case it drools. All the buttons sit on top that makes it very convenient to press them with the index finger, even “in the blind”. Bottom button toggles modes in that order. 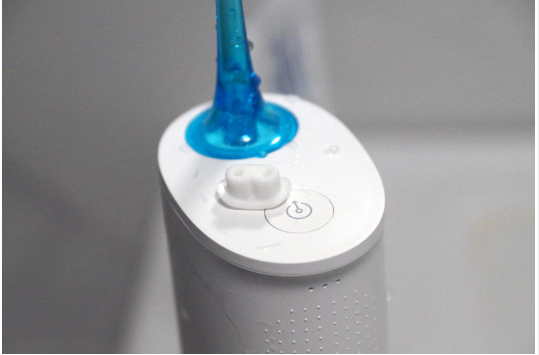 Soft mode: This mode provides water flow in low pressure, convenient for those who have damaged or bleeding gums. Standard mode: Medium pressure water, suitable for all. 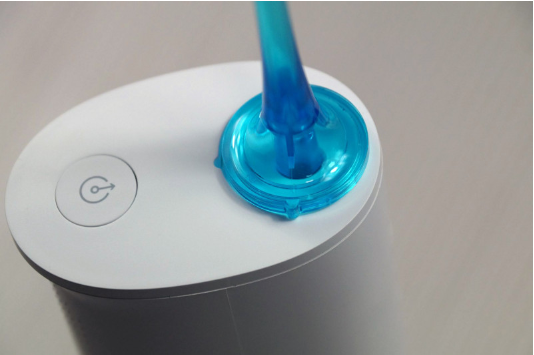 Pulse mode: This is the fastest mode available for gum massage, for a fraction of a second the water supply is turned on with maximum pressure, then stops automatically. 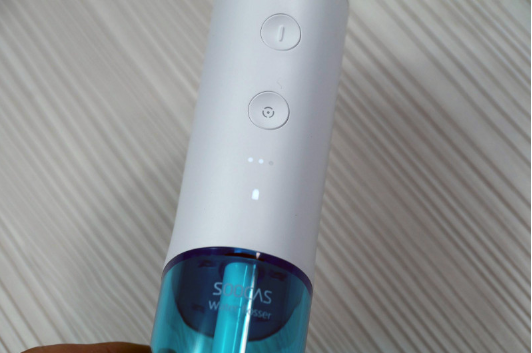 Water is filled in the container from the bottom, but the Xiaomi SOOCAS W3 lacks a water-free sensor. 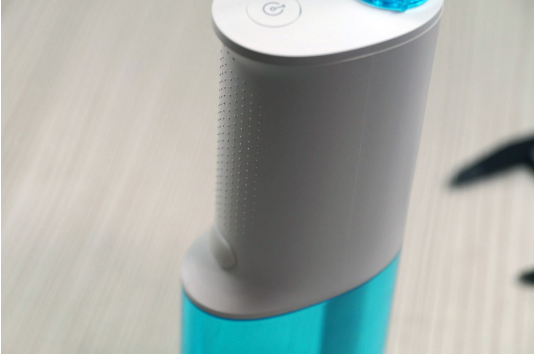 Even if the water in the tank becomes empty, the device continues to work, but without water. As it also not mentioned in the instruction manual, we will not recommend to run it without water. 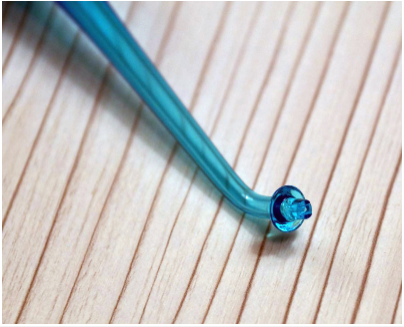 The nozzle fit in the uppermost part of the irrigator, and for precise positioning, there is a special nose-guide. You cannot pull out the nozzle without pressing the “release” button of the nozzle, we try it but without any success. The nozzle sits very tightly on the Xiaomi SOOCAS W3, but you can easily pull it out after pressing the button. However, if you press the button while the irrigator is working, you have to look for it on the floor. Under the rubber mushroom-stub is a port for recharging. 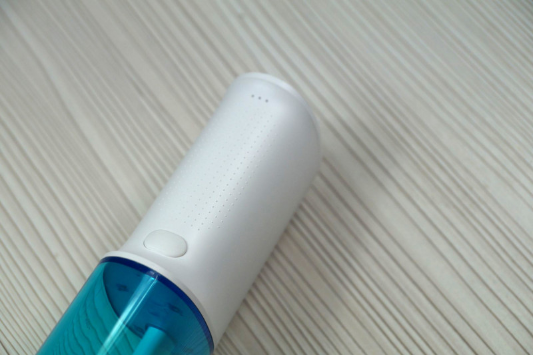 According to the manufacturers the Xiaomi SOOCAS W3 need to be recharged once in every thirty days, however, losing the charging cap is easier than ever. It would have been excellent if they make it foldable rather than wholly pulled out. As like all the products from Xiaomi, the attention to convenience and detail in Xiaomi SOOCAS W3 is excellent. 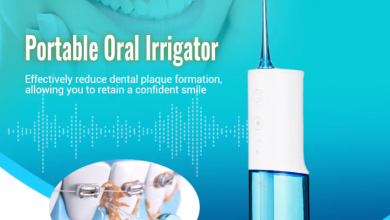 For a comfortable and secure grip, the device comes with small plastic pimples and a rubber “fungus” on the back, which make sure the irrigator does not fall out even from wet hands. 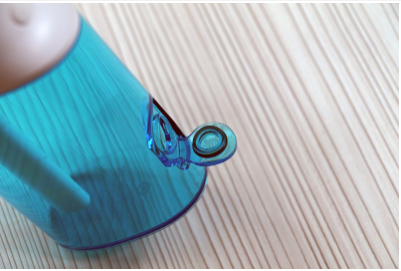 Moreover, the advantageous shape of the handle allows you to hold the device even in a small hand conveniently. Yes, and in the middle of any discomfort do not observe. 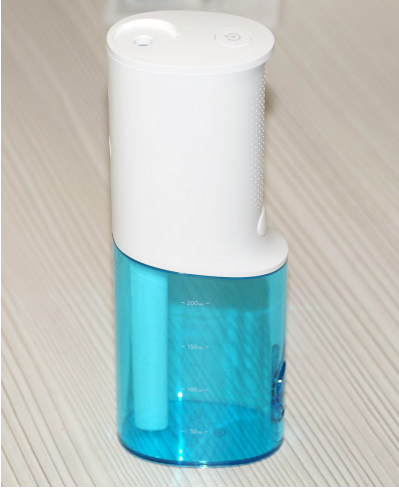 The maximum height with a nozzle measures to be 28.5 cm, length is 7.4 cm, and width is 4.7 cm. The weight of the empty irrigator is 293.6 grams. Now for the test, we fill up the tank with lukewarm water. 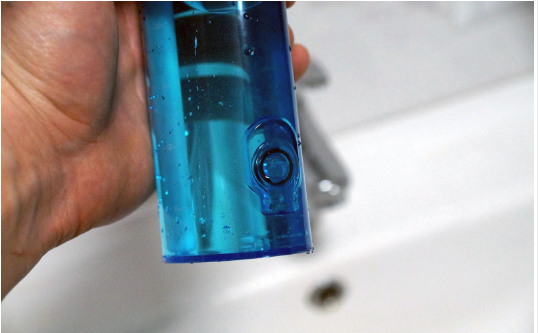 Now close the lid tightly – nothing flows out and water does not leak. In any of the modes, water is supplied as if in portions, so that almost all ways are pulsed. Is that in a pulse delay between the water supply will be more. Soft mode. In the soft mode, the pressure is moderately weak. Standard mode. Even though my gums do not bleed, the first time I turned on this mode was blood. Therefore, for a couple of days I used a soft mode, and only then switched to the standard one. After such an “addiction” there was no blood. Pulse mode. 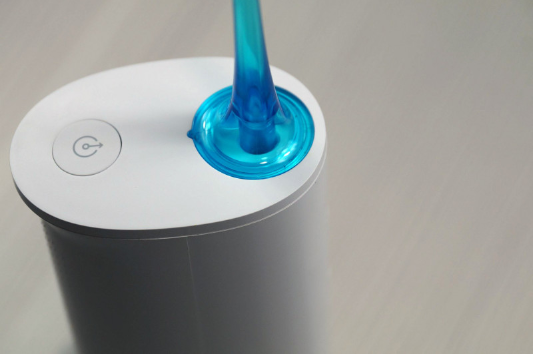 As a massage option, but I prefer to massage the gums with a toothbrush, rather than a water jet. I have teeth and with fillings, and with a crown, talked with my dentist, allowed to use the pier, there will be no problems. I had a tight peanut snack, and after that, I very carefully brushed my teeth with a Xiaomovsky brush before dough. However, the irrigator didn’t care, somewhere between the teeth Xiaomi SOOCAS W3 found small pieces of thin peanut husk and washed it. Xiaomi SOOCAS W3 took his place next to the brush. 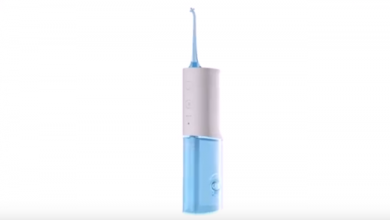 The thing is definitely not the essentials, like a toothbrush, but rather useful. 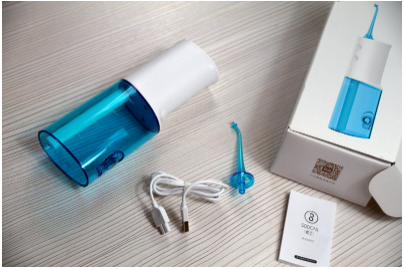 We mainly felt all the advantages of Xiaomi SOOCAS W3, after eating chicken, as instead of picking a toothpick or using floss, just rinse it with the irrigator for 5 seconds and that’s it. From any mode, the water jet reaches to the wall which is at the distance of 4.5 meters. It can be safely considered as a water gun running on batteries. Since we have never used any kind of device like Xiaomi SOOCAS W3, we have nothing to compare with anything. However, leftover food that is not accessible to the brush washes out. An additional advantage of the irrigator is that it can be directly washed right under the tap, which is just as crucial like greasy hands. 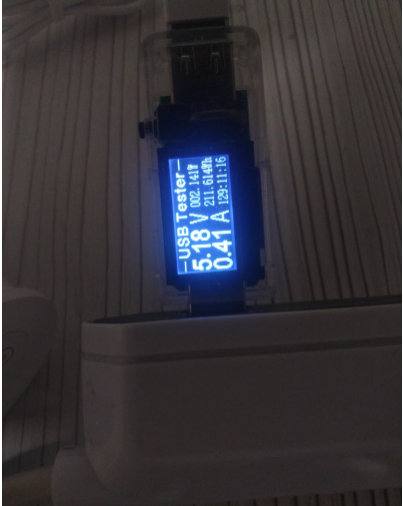 Plus, the battery of the device last long, we had three people for the testing of irrigator, who uses it two times a day and even after eight days it didn’t need recharging. Where to buy Xiaomi SOOCAS W3? The Xiaomi SOOCAS W3 is available on gearbest for price $ 39.99 with coupon code: RUMYSKUCY1. Howdy, I'm Piyush Sharma, Engineer, Pro Blogger and web+tech addicted. I write for xiaomitoday at day and love reading at night. The complicated thing makes me nervous so my motto is: If you can't explain something simply, you don't understand it well enough.